Contact Henrik for availability to present this topic again. The past several books I have written have all been on very niche topics that are not visual at all. These are complex, niche topics which many people do not understand and are not familiar household terms nor concepts. So the challenge is how do I design book covers that are visually simple and eye-catching? I instruct the paid resource on the concepts and keywords I am trying to convey with the book. I am a fan of using word clouds. Note that 4 of the 8 books I worked on have word clouds on the cover. I found a great illustrator that makes word clouds formed into recognisable shapes and symbols (scroll below to see sample book covers). While this project started with a podcast series that later transcribed and funded through a Kickstarter project, the [older] logo for the podcast was incorporated on the cover. The designer added part of a word cloud as the background and rubber stamped “transcribed.” The word cloud seen in the background was used throughout the interior of the book layout thanks to the Designer. Since I had success with Kickstarter and interviewed several other project creators who had even bigger successes with Kickstarter, I found the artist of this word cloud on a stock photography website under “crowdfunding” which the category of Kickstarter. A similar image was found online had the head facing left, so I contacted this artist via email and asked if he could design it facing right with the direction the text read in English is from left to right. The illustrator created this word cloud of a human head with money in mind. 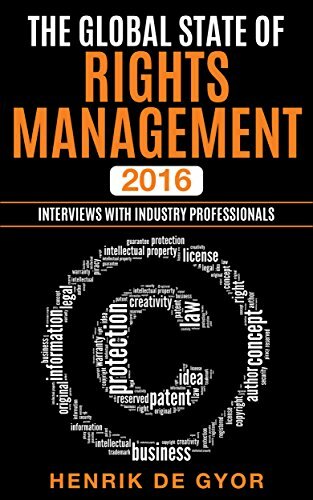 Rights Management is commonly a hard topic to visualise about intellectual property licensing, permissions and copyright. It can be challenging to make visually stimulating. There are very few books on this topic, and covers are often quite dull. This is a bit less dull. The Blockchain is another topic that is not very visual. Blockchain itself about algorithms, hashes, distributed ledgers, and policies, but I discuss the practice uses of this technology. 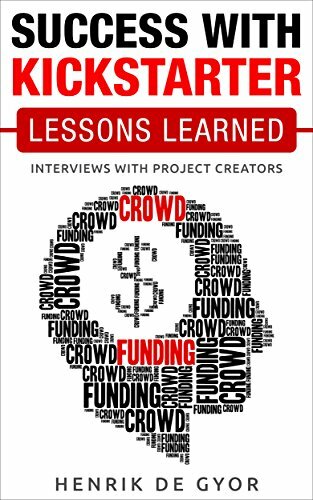 I commissioned the same artist that created the cover for Success with Kickstarter to create a new image with using a bitcoin logo that was overused in this field and not the basis for this book. I will let you think about these two symbols together so you can find out more in the book in case you want your mind blown. Greater than dollars. Beyond money. My co-author came up with the title and was focused on the money generated around Blockchain. I was interested in the billions of people Blockchain technology could effect. Relevant keywords were supplied to the Illustrator to incorporate into this word cloud, which he scaled to size to form these two characters. This image is the cover art for the Blockchain Billions podcast which is also available on iTunes. The last three books listed above were all created were launched within 4 months of each other, but took at least 6 months each to create plus months of research before starting each book project. If you are interested in hearing how I did it, let me know, and I will blog about it here. I will only blog about it if there is an audience who wants to read about it. Look forward to your comments.